The under-representation of female directors continues to be a problem in the Hollywood film industry. Two years after the #MeToo movement, which brought gender inequality to the forefront of public consciousness, there has been little tangible change. Last year, The Guardian noted that there was one female director for every 22 men. Kathryn Bigelow is still the only woman to have won the Oscar for Best Director, which she received in 2009 for The Hurt Locker. In this year’s Oscar line-up, a handful of women feature in the nominations for Best Documentary and Best Foreign Language Film, but no woman was nominated for Best Director. Bucking the general trend are the nominations for Best Animated Short, in which three of the five nominations are for shorts either directed or co-directed by women. Notable amongst the nominations is Pixar’s Bao, directed by Domee Shi, who may soon become the first woman to complete a feature film as director with the studio (Brenda Chapman began working as director on the 2010 film Brave but was replaced by Mark Andrews). The outstanding Irish entry for the animated short film category is Cartoon Saloon’s Late Afternoon, directed by Louise Bagnall. The animation studio has already received three Oscar nominations for their feature films The Secret of Kells (2009), Song of the Sea (2015), and The Breadwinner (2017). 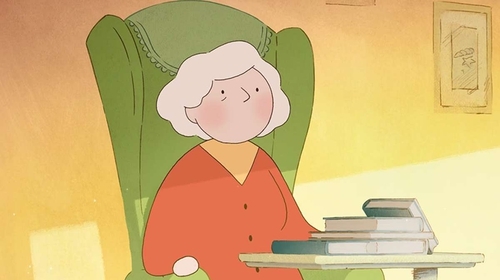 Late Afternoon focuses on the inner and outer world of an elderly woman, Emily, who is experiencing dementia. The character, who is voiced by Fionnula Flanagan, was inspired by Bagnall’s own grandmothers. In interview, she describes how as a child, these women were her grannies, but that as an adult, she realised that "I really only saw a small part of who they were. I didn’t see them as women who led full lives". The short begins by presenting Emily as an isolated character, passive and stationary. The opening shot shows her on an armchair in a sitting room, surrounded by framed photographs and pictures on the wall behind her, suggesting that her life has been lived, and her experiences have been had, framed and put away. A young woman comes in who introduces herself as Kate, allowing the viewer to surmise that Emily has problems with short-term memory. Emily’s loneliness and her separateness is underscored by the static camera in this opening scene. Kate comes in and out of the frame as she performs various tasks. At one point, Kate is in the foreground of the frame and Emily is seen behind her popping out to one side. Visually, she is trying to make herself seen, trying to get Kate’s attention, and trying to be heard – and it’s about more than a request for biscuits to go with her tea. The static camera and the muted colours of this opening scene give way to a short that creates a sense of space, movement and colour, as the film transitions into Emily’s subconscious, and then into the vivid territory of her memories. Each place is made distinct by giving it a different colour palette and artistic style. In Emily’s subconscious her character is sketched sparingly and she navigates through large floating blobs of colour. The memories themselves are vibrant and different colours are associated with different times in Emily’s life. Red is associated with her childhood, purple with her teenage years, and a more complex palette of blues and greens with her life as an adult. Bagnall was searching for a feeling of "flow and momentum" in the short. She creates this partly through the style of animation. It is 2D animation and the texture, colours and economy of the original pencil and watercolour drawings have been maintained in the digital animation. Bagnall describes it as being "like a watercolour painting that’s alive". The sense of fluidity is also created by combinations of movement within the animation itself and movement of the camera. Colm Mac Con Iomaire’s score supports and reflects the short’s pacing and its emotional pitch. Bagnall creates echoes and patterns in settings, characters, actions and movements to create a complex sensory tapestry that identifies connections between different parts of Emily’s life. Combined, these elements present the audience with a tactile, ephemeral and emotional journey into the mind and memories of an elderly woman, evoking the richness of the lived she has lived and the way in which that life is still part of her, still accessible to her, and still - perhaps increasingly as her dementia worsens – real to her. In an industry where the under-representation of female directors appears to be an intractable problem, Bagnall demonstrates why having women at the helm presenting complex female characters is so important. The stories are not just women’s stories, they are universal stories. Her character Emily is a woman, a mother and a grandmother, but also a person who is coming to terms with the human experience of ageing. Past and present realities merge and blend in a way that viewers of all ages can identify with, transcending time and place, age and gender, to capture the power of memory.